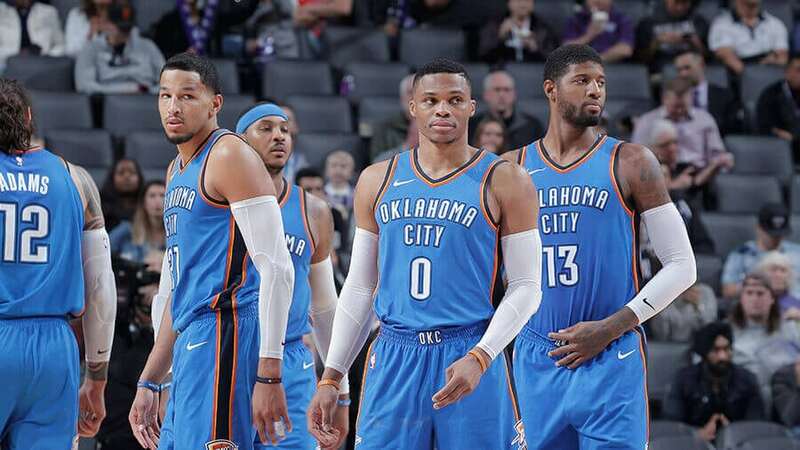 Thursday’s NBA preview breaks down the feature game between the Toronto Raptors and Oklahoma City Thunder, along with NBA tips for all other matches being played today. The 50-21 Raptors are second in the Eastern Conference, but have won only half of their last eight games. Toronto went down at Detroit on the weekend but swamped the Knicks by 36 points at home the following day. Kawhi Leonard was rested from the latter game but is likely to return, but Kyle Lowry (ankle) is in doubt. Serge Ibaka is set to return from a three-game suspension – though Marc Gasol did a solid job in his stead. The 42-29 Thunder have slipped to sixth in the West after losing nine of their last 13 games. They are currently on a three-game losing run, going down to the Pacers, Warriors and Heat. Russell Westbook served a one-game suspension during the Heat loss. He’ll be raring to add to his league-high tally of 27 triple-doubles this season. The Thunder have won three straight against the Raptors, scoring 123-plus points in each. Last season they won 124-107 in Oklahoma City and 132-125 in Toronto. Russell Westbrook averaged 33.5 points, 13.5 assists and 10.5 rebounds across the two victories. But the Raptors have won two of their last three in OKC. The Thunder are 23-11 on the road, but have won only two of their last six at Chesapeake Energy Arena. The Raptors have a 21-14 away record, but have won only two of five on the road in March. The start being afforded to Toronto is hard to resist with Oklahoma City struggling for form.